The countryside in Eastern Finland, close to the border with Russia is more hilly than in the west of the country. There are these soft hills which resemble waves in the open sea. 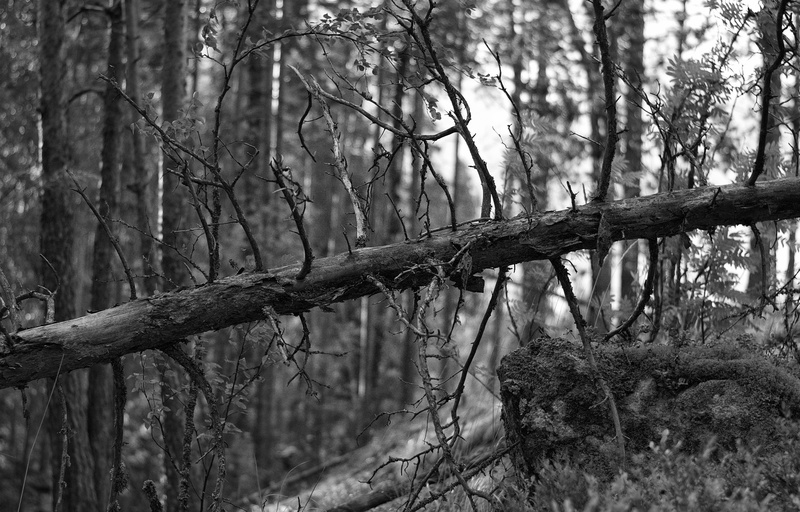 About 150 years ago this part of Finland was covered by forest and bug rocks. The farmers who settled here cleared the land one tree at a time, one rock at a time. Some of those rocks were used to build the foundation for the farmhouses. Hard work that in the winter had probably to stop to wait for the spring and the summer. This is the last photograph fo this series. Next week I will start a new series of nine photographs from a different country. Different life stories. The wind was blowing strong the day we took this walk. The radio and the weather apps where informing about this big snow storm coming which would touch more than half of Finland. People were advised to stay in for the night and the early hours of the following day. We had few hours of light and went for a walk in the countryside. The light was grey. The wind was carrying dry snow which made the air seems a bit foggy. It was not possible to take a tack sharp picture. The road followed the up and downs of the fields and its sides were one with the field nearby. The ditch that usually separates this road from the fields had disappeared under the snow. Then we saw this barn near a farm. People live here. Farmers own this land. I stopped for a second in the middle of the road. Listen to the wind. I thought about the life of those living here. How do these farmers cope with the long winter? How do they manage their farm and income? How far do their kids have to go to get to school? What do they think when they look outside the windows of their homes? I took this photograph as the cold wind from the east was taking my thoughts away with it. I put my hand in the pockets of my jacket to warm them and walked back to the cottage facing the wind. In winter there are the frozen lakes. The trees in the forest covered with snow. There is also the countryside where farmers live and where the life seems to pause during the winter. The are no birds. The is silence broken only by the winds and the noise of the snow under the shows when walking. It all seems very remote and distant as farmers wait for the spring when the winter will to let go and they can start again their work in the fields. I will continue this series until I reach nine photographs and will then switch to a new series with new landscapes and context. I woke up and went down to the lake. It had snowed a lot over the previous two days. The mark left by the snowmobile where not too fresh but still very visible. Somebody had passed nearby the shore but I could not remember hearing it. The made a small detour thinking about whether to get back from here or continue. The trees were holding the snow and when I turned the image to black and white I thought that it seemed a copper-etched print. There is this lake in Eastern Finland. It freezes in the early winter and stays frozen until the end of March. It is a large lake and when the winter starts and the temperature drops a thin layer of ice begins to form starting from the shorelines and moving slowly towards the center. Then it can snow and the thin layer of ice gets covered by a white mantle which hides how thick the ice really is. But this is a large lake. Water moves. There are streams and currents hidden under the ice. In the silence of the the winter one can easily hear the sudden sound of cracks or a strange noise as if huge bubbles would try to break and escape the hard ice surface that will cover them until the spring. Another photograph from Eastern Finland for the Winter Wonderland Series. I have few more to post. I will see how far I can go with these. Pyhäjärvi is large lake in Eastern Finland. You can follow it going east and you will end up in Russia after passing the island of Havukkasaari. I think the landscape on the other side of the border it pretty similar to the one on this side of the border. Water. Ice in winter. Island. The line fo the forest at designing the horizon. At the same time, it seems to me that Russia is very far away. Almost unreachable. Unknowable. An unassuming railway station where the long distance trains which run north-south-north stop to let passengers catch the trains that run to the east. Now that it is winter, passengers seem unsure whether to wait for their next train on the platform or taking refuge, if only for few minutes, in the station building next to the ticket counters and the café. Outside on the platform, people are waiting their next train wrapped in their thoughts. Some will soon be home. Others have a long way to go. All in that strange no-man zone which is a transit railway station. It has been snowing a lot during the last few days. The snow has brought silence in the forest. The wind has stopped blowing. There is an incredible peace if one stops for a moment to listen to the silence. I am cleaning up photos in old folders. Deleting what I do not want to keep and saving and storing the ones I want to keep and share again. I found these photos taken January in 2007, right after the new year, on an early afternoon. The light was magic. The lake and the nature very quiet. No wind. Juts the sky, the ice and the sun. 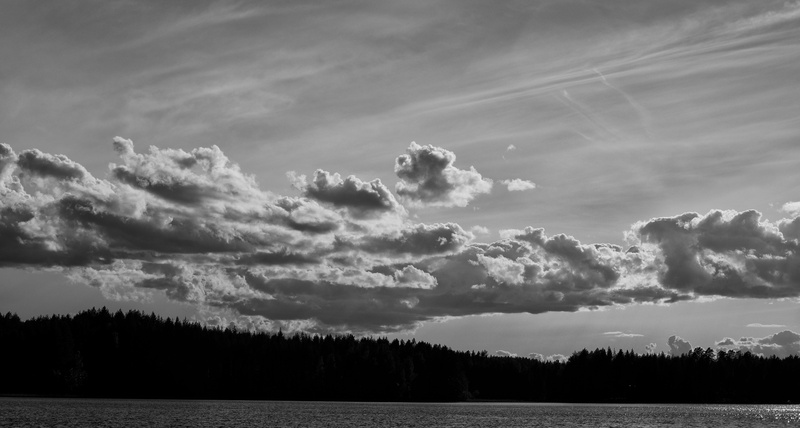 This photo was taken last July while we were at our summer cottage in Eastern Finland. 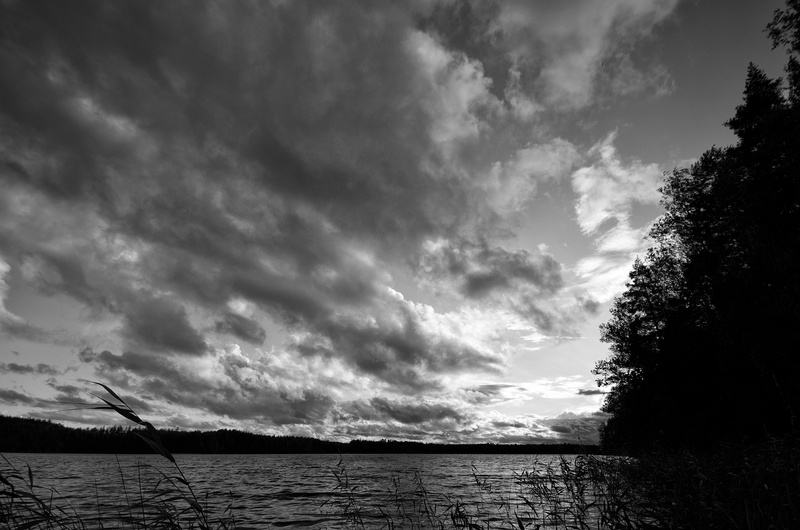 I liked to wait for the time of the day when clouds would appear and create nice contrast with the water of the lake.